To deliver a presidential address to a joint session of Congress is surely a high privilege, but to do so to at the start of one&apos;s eighth and final year in that office is a rare occasion indeed. The U.S. had 43 presidents before Barack Obama, but only five of them stood before the Congress as Obama will this Tuesday night — as twice-elected incumbents beginning their final year with a report on the state of the union. 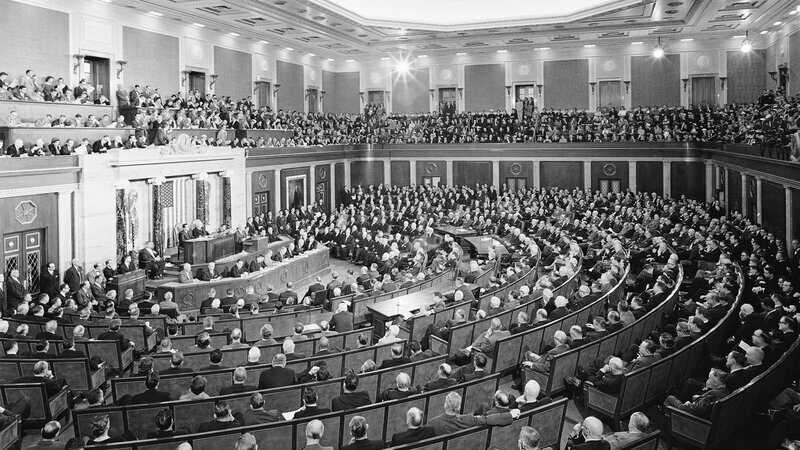 Such reports in our time have become synonymous with speeches delivered before a packed House chamber, with the highest elected and appointed officials in Washington also on hand — from the cabinet and Joint Chiefs of Staff to the Supreme Court. They have been broadcast on radio since the early 1920s and on carried television since the late 1940s. But for much of U.S. history, the "State of the Union" was a written report sent to Capitol Hill by a president who did not deign to deliver it in person. It did not begin that way. The very first president, George Washington, began his final year in office in 1796 with a personal appearance before the assembled House and Senate. In those days the Congress did not meet in Washington, where construction of the Capitol was underway. Instead, the Congress met in Congress Hall in Philadelphia, the city that gave birth to the Constitution. But even far from his home in Virginia and past his personal prime, the first president seemed quite at home creating a tradition. 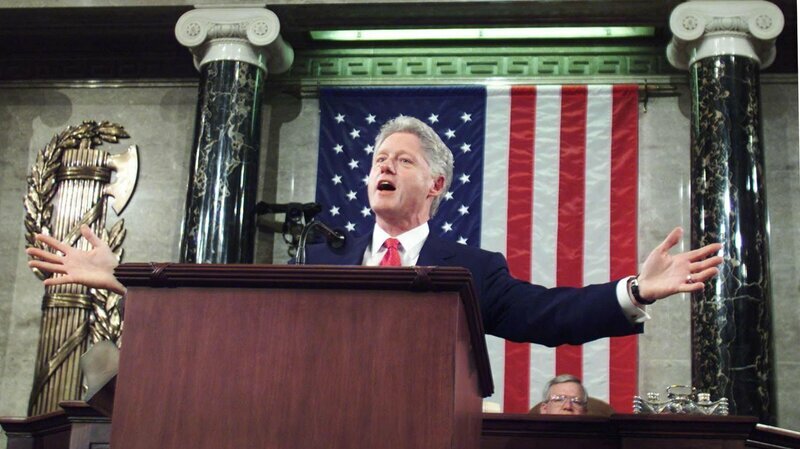 Ever since, eighth-year reports on the state of the union have carried a special portent, because presidents saw in them a unique opportunity to address their own record and the future of the country. Washington was a military man, surveyor and farmer, but not a speechmaker as a rule. He did not go out of his way to find speaking gigs. But he agreed to deliver his report on how the country was doing in person in Philadelphia in most of the years he was president, including at the beginning of the year he knew would be his last as the nation&apos;s leader. Much of his speech cataloged negotiations underway with various European powers and American Indian tribes. "To an active external commerce the protection of a naval force is indispensable. This is manifest with regard to wars in which a State is itself a party. But besides this, it is in our own experience that the most sincere neutrality is not a sufficient guard against the depredations of nations at war." 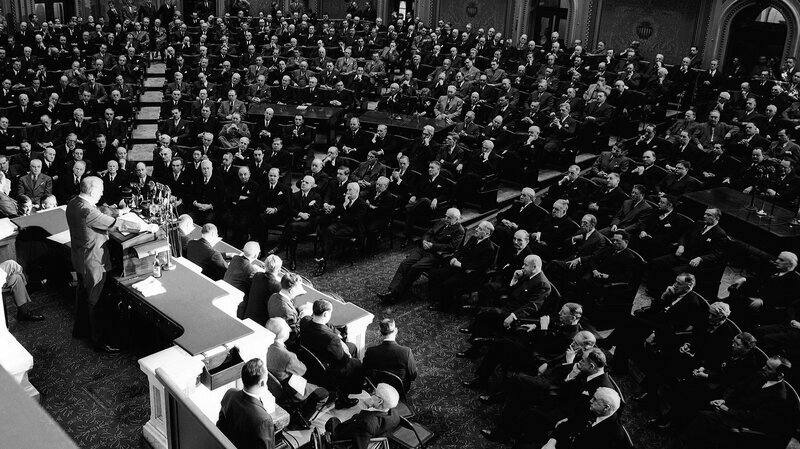 Washington argued that sea power might even be a deterrent to actual war, an early appearance of the "peace through strength" argument that has been popular ever since. He also wanted a military school to train army officers and a "national university" that would expand on the private seminaries and colleges that were springing up around the former colonies. In the end, Congress would start a Navy and start a military academy at West Point. And two out of three is not bad — especially considering how well presidential proposals have fared since. The second president, John Adams, also delivered his SOTU reports in person. But after his four years in office, his successor, Thomas Jefferson, ended that practice. He apparently regarded it as a touch too imperial for his taste, and thereafter no president went to Capitol Hill to enunciate his message until Woodrow Wilson, who did not come along until 1912. Wilson served eight years but was not in good enough health to address Congress by the end. The next president to have an eighth year in office was Franklin D. Roosevelt, but unlike all other U.S. presidents before and since, FDR spent his eighth year in office seeking (and winning) a third term. So when he spoke to Congress at the beginning of 1940 he didn&apos;t anticipate leaving any time soon. But in 1960, with the two-term tradition restored by an amendment to the Constitution, Dwight D. Eisenhower went before Congress for a final SOTU speech knowing full well he would not be back. "Ike," as he was known since his days as the hero general of World War II, gave a profoundly serious speech that year, befitting the parlous days of the Cold War. Confrontations with the Soviet Union and Communist China were the uppermost concerns of the time, and Communism was on the march in Latin America and Southeast Asia as well. Eisenhower also found time in his speech to warn about bad labor-management relations leading to too many strikes (a recent stoppage in steel production had been especially worrisome) and about the debilitating effects of inflation. Among the policy prescriptions he pushed was a government budget surplus — to be sought even at the expense of high taxes — so as to pay down a national debt Ike thought dangerously large. It was about $290 billion at the time, today it is about 60 times higher in nominal dollars (unadjusted for inflation). Ike thought it was time to balance the budget, but not to cut defense or space spending. "I shall present to the Congress for 1961 a balanced budget. In the area of defense, expenditures continue at the record peace-time levels of the last several years. With a single exception, expenditures in every major category of Health, Education and Welfare will be equal or greater than last year. In Space expenditures the amounts are practically doubled." "I am not unique as a President in having worked with a Congress controlled by the opposition party—except that no other President ever did it for quite so long! Yet in both personal and official relationships we have weathered the storms of the past five years. For this I am grateful." Ike would give way in 1961 to John F. Kennedy, who was assassinated in 1963. His successor, Lyndon B. Johnson, would have only a little over five years in office. He was followed by Richard M Nixon, who resigned midway through his second term, and Gerald R. Ford, who served out the remainder of that term. Jimmy Carter was elected in 1976 but defeated for re-election in 1980 by Ronald Reagan. "And as we have worked together to bring down spending, tax rates, and inflation, employment has climbed to record heights; America has created more jobs and better, higher paying jobs; family income has risen for 4 straight years, and America&apos;s poor climbed out of poverty at the fastest rate in more than 10 years." Reagan also praised the spirit of freedom that he said had advanced the cause of American interests and national security in foreign affairs — granting himself some of the credit by proxy. "In international relations, too, there&apos;s only one description for what, together, we have achieved: a complete turnabout, a revolution. Seven years ago, America was weak, and freedom everywhere was under siege. Today America is strong, and democracy is everywhere on the move." One of the achievements of Reagan&apos;s presidency was handing the White House over to his vice president, George H.W. Bush. 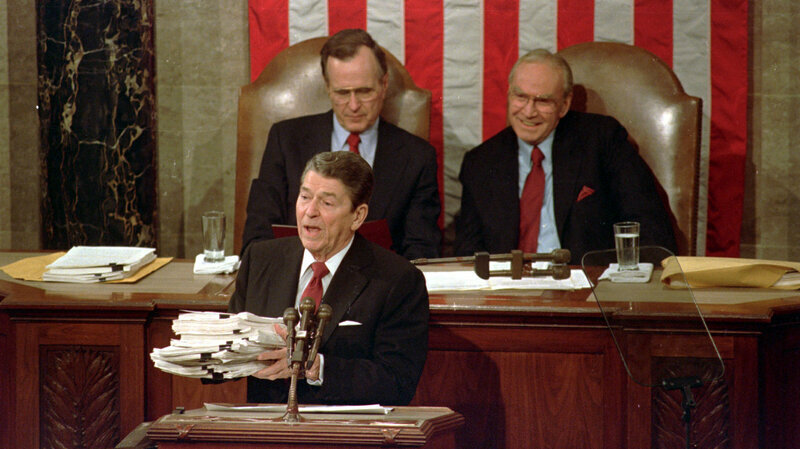 Though Bush did not claim to have Reagan&apos;s gifts as a presenter, Bush gave four SOTU addresses that were generally well received. He did not fare as well with the voters in 1992, however, and did not have a second term. "We are fortunate to be alive at this moment in history. Never before has our Nation enjoyed, at once, so much prosperity and social progress with so little internal crisis and so few external threats. Never before have we had such a blessed opportunity and, therefore, such a profound obligation to build the more perfect Union of our Founders&apos; dreams." "My fellow Americans, we have crossed the bridge we built to the 21st century. Now, we must shape a 21st century American revolution of opportunity, responsibility, and community. We must be now, as we were in the beginning, a new nation." Gore was reluctant to embrace the Clinton legacy, however, fearing he would be bogged down in Clinton&apos;s impeachment history and personal peccadilloes. He came close to winning the presidency in his own right, losing by the narrowest margin in Electoral College history to George W. Bush, the son of the man Clinton had defeated eight years earlier. "Any further drawdown of U.S. troops will be based on conditions in Iraq and the recommendations of our commanders. General Petraeus has warned that too fast a drawdown could result in, quote, "the disintegration of the Iraqi security forces, Al Qaida-Iraq regaining lost ground, and a marked increase in violence." Members of Congress, having come so far and achieved so much, we must not allow this to happen." "In the coming year, we will work with Iraqi leaders as they build on the progress they&apos;re making toward political reconciliation. At the local level, Sunnis, Shi&apos;a, and Kurds are beginning to come together to reclaim their communities and rebuild their lives. Progress in the Provinces must be matched by progress in Baghdad. We&apos;re seeing some encouraging signs." "There are two other pressing challenges that I&apos;ve raised repeatedly before this body and that this body has failed to address: entitlement spending and immigration. Every Member in this Chamber knows that spending on entitlement programs like Social Security, Medicare, and Medicaid is growing faster than we can afford. We all know the painful choices ahead if America stays on this path: massive tax increases, sudden and drastic cuts in benefits, or crippling deficits." At the time of his last SOTU report, Bush could still take pride in a robust economic recovery from the rough years of 2001 and 2002. But the markets had turned shaky in the preceding fall, and the first signs of massive problems with mortgage-backed securities were emerging. Some defenders had urged him to make more of the economic good news from his administration in his final SOTU, but such talk ceased when investment banks and insurance companies began failing that spring, summer and fall. The struggle to bail out the financial sector with public funds helped cripple the Republican nominee that next November, ushering in the two-term presidency of Barack Obama. This week, it will be Obama&apos;s turn to see how a final SOTU report can encapsulate a presidency or pave the way for greater success before a given presidency ends. His chief of staff says the speech will be "a big optimistic generous view of the future."